I received a copy of “Hello, World! Dinosaurs” ($7.99 value) in exchange for this promotion. Any opinions expressed here are honest and my own. 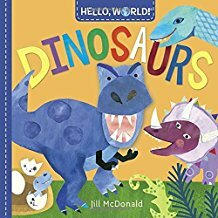 Babies and toddlers alike will enjoy this sturdy colorful board book as they learn about many dinosaurs, including an Apatosaurus, Compsognathus, and Triceratops, just to name a few. Sounds a bit overwhelming for a little one?? Not at all, as McDonald does a great job with using easy language to engage young children along the way. Also, with the interesting dinosaur facts thrown in, adults will surely learn a thing or two about dinosaurs too. Hello, World! Dinosaurs can be purchased at Amazon, Barnes & Noble and anywhere children’s books are sold. Also, look for all the books in the Hello, World! series: Solar System, Weather, Backyard Bugs, Birds, and My Body. JILL McDONALD is the Missouri-based illustrator of the Hello, World! board book series. Jill’s cheery and colorful art can be found on clothing, fabric, bedding, stationery, puzzles, and games, and in a variety of books for babies and toddlers. Learn more about Jill’s work at jillmcdonalddesign.com.